“Takagi Yōshin-ryū is a style of jūjutsu. Of course it’s not ninjutsu. That is obvious. Historically, the founder of this style, Takagi Oriemon, practiced a school called ‘Takenouchi-ryū’ (竹内流), one of the oldest and most famous traditions of ‘sōgō bujutsu’ (composite martial arts; 総合武術) of Japan. The reason why I say sōgō bujutsu is because you also have weapons. So, sōgō bujutsu in martial arts means ‘general martial art’ or ‘various martial arts’. From one point, a nucleus, they teach many, many weapons. Takagi Oriemon had learned this method with the second generation, but the problem with the Takenouchi family is that they never gave the inner movement, the deepest understanding, to someone from outside of the family. That was one of the main rules back in the 14th and 16th centuries. But he learned enough to create his own style. He received many things and, with that, he had many matches, fights, and duels with many people. He then went to learn ‘Yagyū Shinkage-ryū’, and from that point he created the school called ‘Takagi Yōshin-ryū’. What you need to know is that what he created, was not all the techniques in this scroll. You need to wait at least four generations following his lifetime before you start to have something that is possible to pass on. Because in order to be a master, first you need to master something. Then, you need to be able to teach it, talk about it, give it to someone, and to explain to someone. If you can’t explain, you need to find someone who can explain for you. In the martial arts, this is very deep and very difficult. So we need to wait four generations, until the day that Takamatsu-sensei met Mizutani-sensei. And, before this, Takamatsu-sensei had already inherited seven traditions from his grandfather, Toda-sensei. So, already he was skilled in the way of observing and performing techniques in a very special way. Something unique to ninjutsu. Something different. Different in using the mind and different in using the body. So, when he watched and learned Takagi Yōshin-ryū, after only one year he was taught the top level techniques; the ‘gokui’ (essence of the tradition; 極意). He was only seventeen. Of course Mizuta-sensei had different students who received ‘menkyo kaiden’ (full license transmission; 免許皆伝). Both were menkyo kaiden, as it is mentioned in this history section of the scroll. Sometimes these things were bought because, of course, Mizuta-sensei sometimes needed to eat; since his only source of income was martial arts. So, sometimes a master would sell a certificate of transmission. This isn’t too different from nowadays, as well. So Takamatsu-sensei, as he had very beautiful handwriting and had learned Chinese, was the one who wrote the scroll. So. 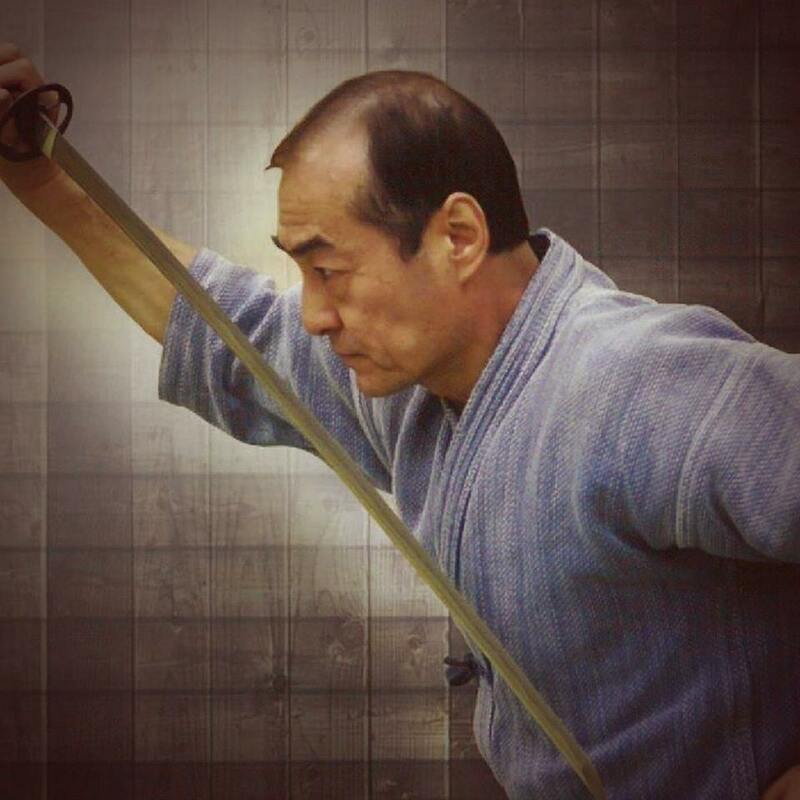 he wrote these scrolls by his sensei’s instruction, and sometimes Mizuta would say, “Write this, but don’t include this part.” So, step-by-step, for example the art of ‘iai’ (drawing the sword; 居合), the art of ‘kodachi’ (short sword; 小太刀), the art of rope, or the jō (approx. four-foot staff; 状), was lost or forgotten. Takamatsu-sensei, though, received the entire transmission of the school. SANKEN (三見), which translates literally as ‘the three glances’, is a term that was used by various highly-skilled swordsmen of the Yagyû clan in Japanese history. It indicates the three-fold action of vigilant and highly focused observation of the enemy’s mental state, physical posture, and method of initial engagement, the moment when weapons are crossed in battle. The way in which the enemy holds his weapon is one facet of this intense observation and gives immediate insight as to whether the opponent is nervous, composed, weakened, strong, highly skilled, or inexperienced. Thus, one gains an edge on the engagement and can therefore take the proper initiative and course of action in combat. 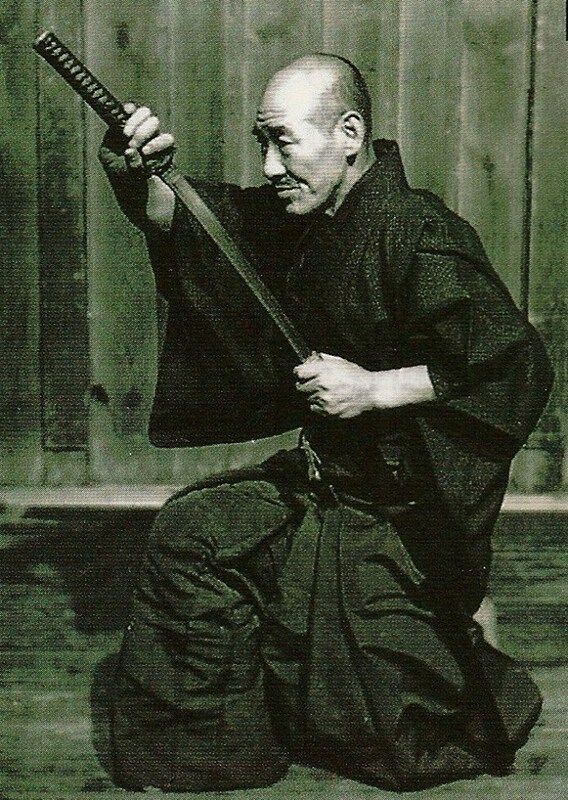 Yasuji Kuroda, (1897 – 1976), was the 13th Sōke of Shishin Takuma-ryū jujutsu, Komagawa Kaishin-ryū kenjutsu, Tamiya-ryū, Tsubaki Kotengu-ryū bōjutsu, Seigyoku Oguri-ryū, and Otengu (Daitengu)-ryū. Renowned and respected greatly for his rare skill by his peers and other swordsmen of the day, a number of anecdotes about the man have survived that paint a unique portrait of a rare warrior and master, the type that only seemed to exist in the civil war annals of Old Japan. * As a child, Yasuji often went to a liquor store to buy alcohol. There was a large dog that would always bark fiercely at him and would give chase when he passed. One day, he opened the wooden door of the shop to hail the owner, the dog suddenly rushed upon him. He leapt face first into the danger, drawing his sword, and decapitated the animal. * Once, he was attacked at gunpoint by a couple of violent thieves, as he made his way along a quiet road in town. With almost imperceptible speed, he drew his sword and cut the gun wielding attacker’s revolver in half. half with one stroke of a blunt saber. * Once, a sword-weilding ronin attacked he and his friend in the country. When the ronin swung his sword, the blade broke away from the ‘tsuka’ (handle) and was sailing towards the head of Yasuji’s friend. Yasuji instantly, and with seemingly impossible speed, stepped in front of his friend and let the blade pierce his own shoulder to save his life. The entire incident took place in a tenth of a second. Komagawa Tarōzaemon first learned Shinkage-ryū from Kamiizumi Ise no kami Nobutsuna. But even though he soon felt confident in his skills, Kamiizumi would refuse to give him the Shinkage-ryū menkyo, only saying that Komagawa had a “bad habit” in his movements. Komagawa felt wronged by his teacher’s constant rebuttals and decided to take the high road and impress Kamiizumi by getting a menkyo in many other kenjutsu ryū. Returning some years later with over a dozen menkyo, he tried to get Kamiizumi to give him his hard-earned Shinkage-ryū menkyo at last by showing him what he had learned. But Kamiizumi didn’t flinch a bit and stuck to his previous statement about Komagawa having something not quite right in his movements. Then something happened that made Komagawa change his outlook on his whole practice up to then. One evening, while Komagawa was deeply engaged in training, a pack of wolf sneaked up on him. 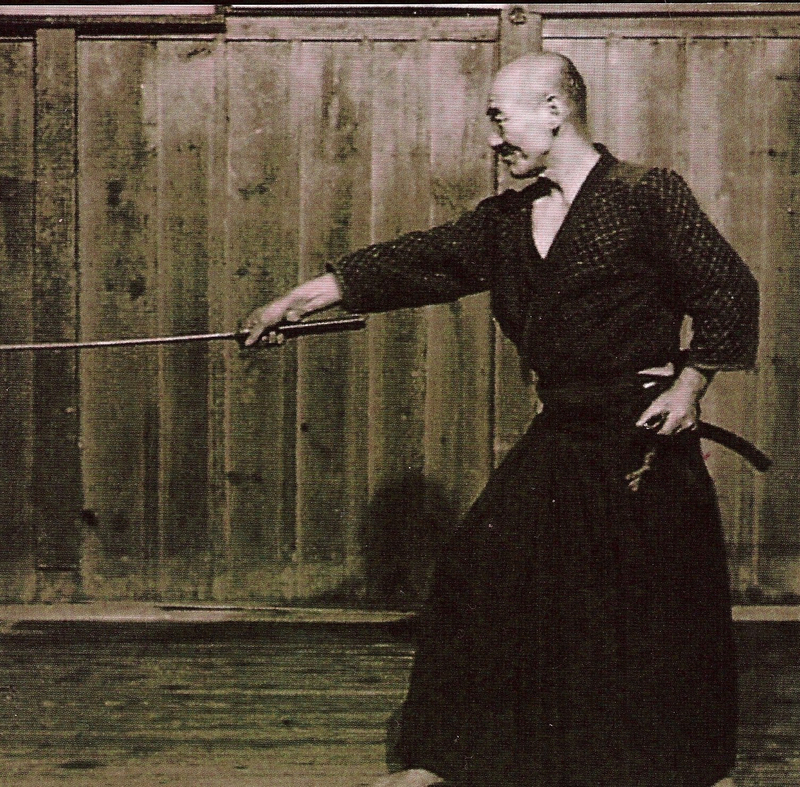 He only had a wakizashi on himself at the time, but he still managed to drive off the pack by repeatedly using a single technique, technique which would later become the first tachi kata and the basis of Komagawa Kaishin-ryū’s whole curriculum. During the tense fight, Komagawa realized that he was left-handed and that this was what Kamiizumi referred to by saying he had a “bad habit”. Komagawa then rebased his whole attitude towards his teacher and changed his name to “Kaishin” or “renewed heart” to show that fact. After correcting his movements, he was finally given a Shinkage-ryū menkyo by Kamiizumi. Komagawa then taught under the banner of Shinkage-ryū. The name of the ryū was changed to its present name by one of Komagawa’s student, Sakurada Jirōzaemon Sadakuni (桜田次郎左衛門貞国). Sakurada also added the jutte kata to the curriculum. In 1767 (Meiwa 4), a samurai by the name of Fujii Umon Sadayuki (藤井右門定之), real name Fujii Naoaki Yoshitarō (藤井直明吉太郎), was sentenced and executed for ‘lèse majesté’ towards the Tokugawa Shogunate along with his teacher, a renowned scholar of Confucianism and military strategy named Yamagata Daini. They were denounced by troublemakers on the public place thus forcing the shogunate into investigating the allegations, which were that they conspired to mount a revolt against the shogunate in an attempt to reestablish the Emperor as de facto ruler of Japan. Since the trials and subsequent verdicts were kept secret even though the accusations were first made publicly, both were in the meantime unjustly vilified by the public as traitors to the shōgun and disturbers of the peace. The vilification intensified after their executions, which were made in public, while the specific offenses under which they were condemned still remained secret. The reason to this secrecy may be that the shogunate wanted the rumours about their association with the restoration movement to continue, although the two men were ultimately not found guilty of advocating the restoration of power to the Emperor. It was true, however, that Yamagata criticized the Tokugawa regime in a published book, and so the shogunate felt they had to act rapidly. The students of Yamagata were thus almost immediately released, except for Umon who was directly implicated in the original allegations as he was the one who spurred the troublemakers. The student and the teacher were later executed, in all probability as a deterrent to the proponents of restoration, while the troublemakers were exiled. At the time of this incident, Umon was the chief proponent of Komagawa Kaishin-ryū, going so far as to add a complete series of kodachi kata in the curriculum, a series that has been handed down to this day. As a consequence of the bad influence brought on the ryū’s name by Umon’s involvement in what was then seen by the public at large as an attempted revolt, many if not all fiefs closed down their Komagawa Kaishin-ryū school branches. Even in Toyama, the birthplace of the ryū, it has since then been publicly referred to by the name of its parent art, the Shinkage-ryū. The secrecy was so complete that even the grandfather of the current sōke, the 13th sōke Kuroda Yasuji, thought when he was young that he was practicing Shinkage-ryū. Only by comparing his techniques with practitioners of other ryū did the thought cross his mind that he did not actually practice Shinkage-ryū at all. He then asked his own father, the 11th sōke Kuroda Hiroshi Masakuni, who passed down this story about the concealment of the ryū’s real name and origins. Yasuji was thus the first to use the name “Komagawa Kaishin-ryū” outside of Toyama since the incident when he relocated to Tokyo at the start of the Taishō period.